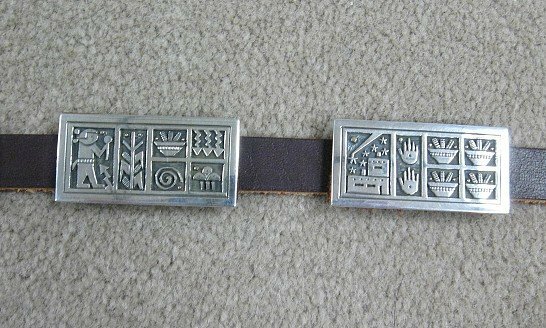 This fantastic sterling silver & 14k gold overlay pueblo storyteller concho belt was handmade by Santo Domingo silversmith, Joseph Coriz. 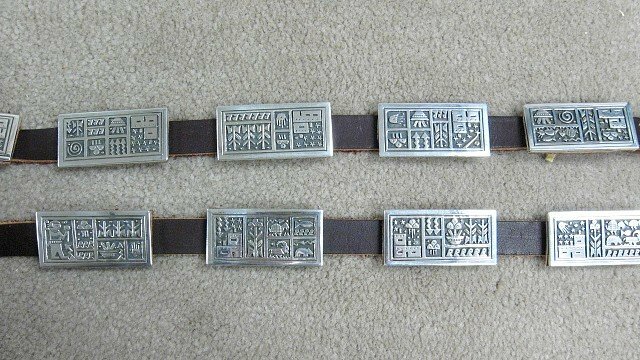 There are 12 sterling silver conchos plus the sterling silver buckle for a total of 13 different storyteller scenes. There are several solid 14k gold overlay accents on every concho. 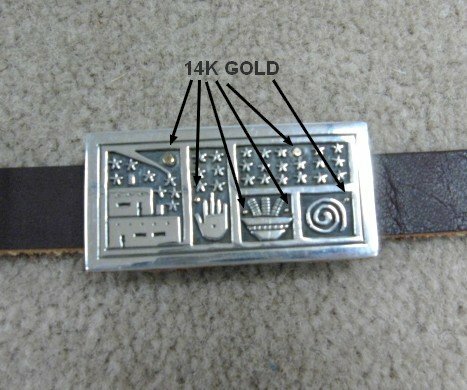 (The suns & stars above the pueblo scenes 14K gold). 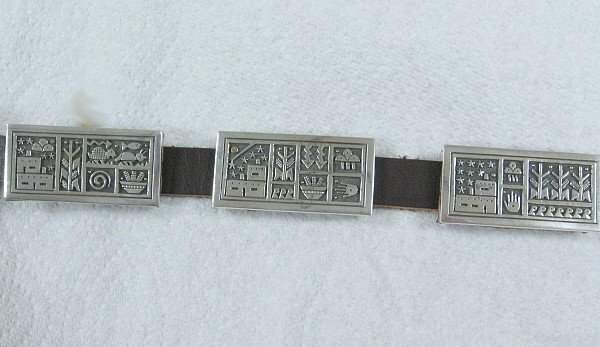 Each of the rectangular conchos represents a vignette of the forces that result in a healthy crop of corn, which is the Pueblo staff of life and symbol of prosperity, health and happiness. The elements that encourage a good corn harvest are water, sun, and some blessing from the heavens. 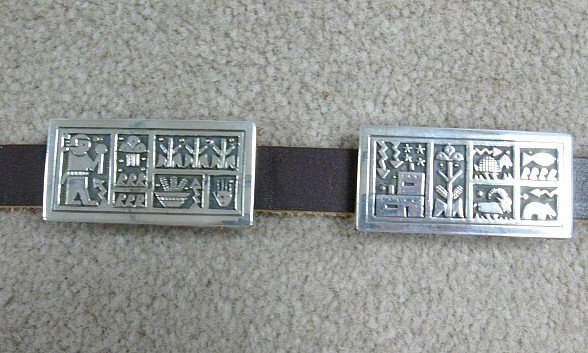 Therefore, the belt is also called a prosperity belt! Each concho measures 2 long by 1 wide. 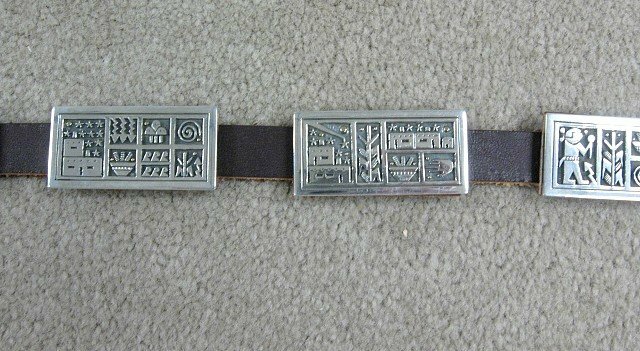 The brown leather belt is 5/8 wide and 50 long end-to-end from the tip of the buckle. 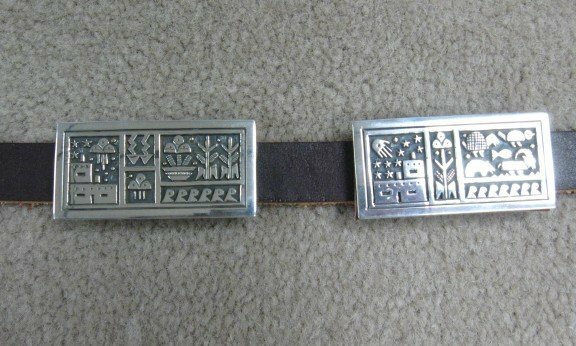 Since this is a brand new belt, there are no holes punched yet on the belt. We will punch the holes to fit your request. And we can cut the leather belt to your desired length. The conchos are incredibly detailed and each once is different from the other. The sparkling sterling silver sturdy conchos are 1/8 thick and affixed to leather backings, also about 1/8 thick. These conchos are then attached to the belt with two copper slides. The conchos can be moved, removed, and/or adjusted as needed. The belt weighs one pound. Brand new and in perfect condition. (Please ignore the reflections in the highly polished silver). Gift Box and Certificate of Authenticity included. Hallmarked by the artist and stamped 14K and Sterling. Joseph Coriz's work is very distinctive and easily recognizable. Joseph Coriz was born into the Santo Domingo Pueblo in 1958. 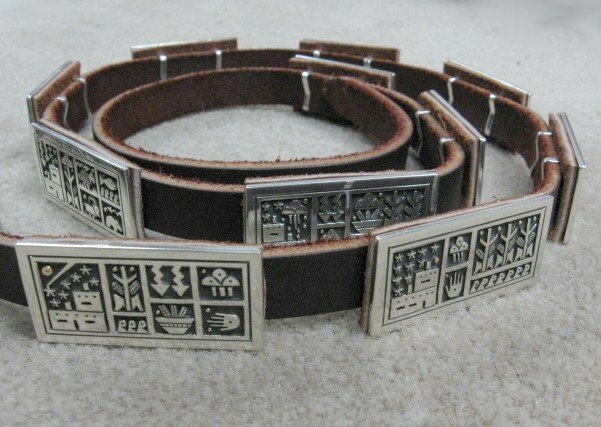 He was inspired by his parents and silversmith Vidal Aragon, who is known for his petroglyph designs. 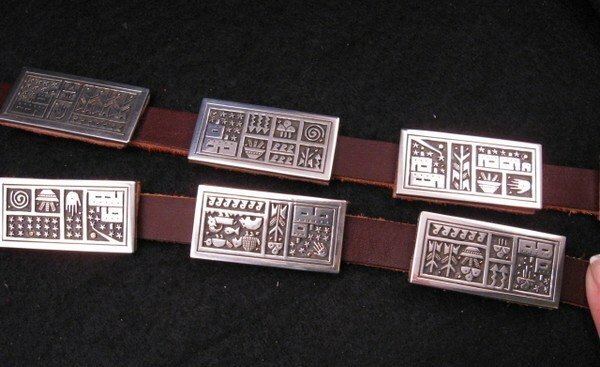 Joseph has combined the traditional methods of hand crafting jewelry with more contemporary ideas, developing his own unique style. Pieces of Joseph's jewelry are in the permanent collection of the National Museum of the American Indian as well as the Wheelwright Museum. He has and continues to participate in important shows, The Eight Northern Indian Pueblo Arts & Crafts Show, San Diego Museum of Man, and the SWAIA Indian Market among them. Awards have been won at several of these shows.